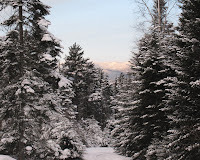 It is one of those days in the Adirondacks. One of those days when it is just too nice out to stay in. Skiing is somewhere on the schedule today. The ski report is easy: awesome everywhere. It is amazing to consider how close the Adirondacks are to the mass of people living along the Eastern Seaboard, yet I can still find someplace to ski for hours without seeing a single person. I am convinced this is why my colleagues and I are still selling real estate; people feel better when they spend time outside. Today's featured photo is this morning's mind-melting view from home.